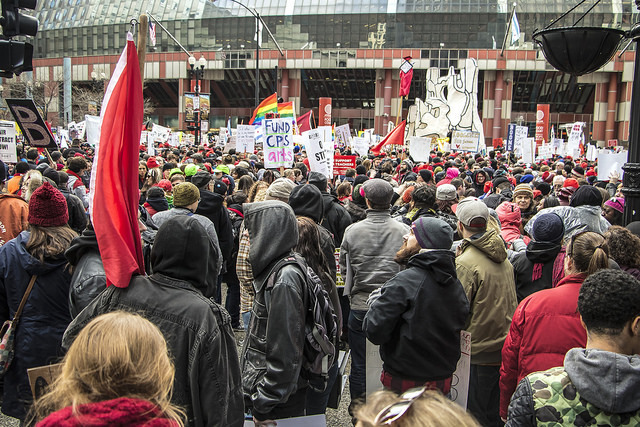 Chicago’s streets were a sea of union red last Friday for a day of action to protest the austerity policies of Rahm Emanuel and Bruce Rauner. I’m proud to have joined twenty thousand souls at the Thompson Center that day. What struck me, once again, was the broad support and solidarity in this movement. It wasn’t just teachers, or students, or parents, or union folks. We were joined by activists from Fight for 15, Black Lives Matter, the LGBTQ community, immigrant rights groups, neighborhood and community organizations and so many more. It’s always an inspiration to see. Here are some great photos of the day from Bob Simpson.